With current water reservoir levels too low for irrigation, Yolo County farmers will likely need to turn to ground water resources for their crops this growing season, officials say. Farmers must rely on private wells and shift their crop patterns unless a sudden rainfall between now and March boosts reservoir levels to the minimum required to release water, said Tim O'Halloran, general director of the Yolo County Flood Control and Water Conservation District. 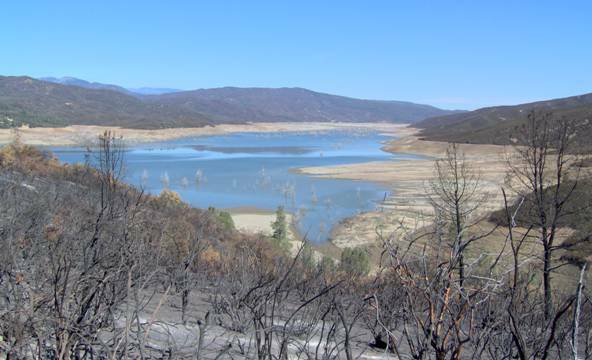 Clear Lake and Indian Valley Reservoir, which supply the central part of the county, are far below the minimum combined capacity of 90,000 acre feet, O'Halloran said. Indian Valley is currently holding only 19,000 acre feet, O'Halloran said. An acre foot is enough to cover a football field one foot deep with water. Indian Valley alone had 265,963 acre feet of stored water Jan. 31, 2006. 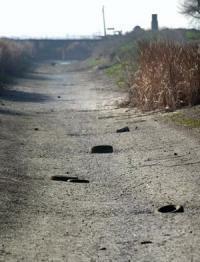 Once hidden by water, illegally discarded tires dot the dry Moore Canal bed. Although empty for maintenance, the Moore Canal and others like it could remain this way during the growing season due to the current water shortage. In terms of Clear Lake, in order for the district to release water the lake level must register at least 3.22 feet on the Rumsey Gauge a term of measurement used to determine water availability, Jen Reed, project manager for the district, said. The current lake level is registering at 1.14 feet on the Rumsey Gauge, well below the lake's ability to let water naturally flow into Cache Creek and on into Yolo County. Clear Lake has a maximum of 7.56 feet on the Rumsey Gauge. This is the third year of below-average rainfall an excess in 2006 was enough to cover for low precipitation in 2007 and 2008, but that bounty of water has run out, O'Halloran said. "We keep hoping for rain and if we get it, that's great," O'Halloran said. The good news is that Yolo County has a healthy supply of quality ground water to serve as an alternative source, County Agricultural Commissioner Rick Landon said. Yolo County fares much better during dry spells compared to other regions in the state, such as the San Joaquin Valley, where the ground water is expensive to pump and the quality is such that it is not worth pumping, Landon said. The ground water supply will also help a number of growers who operate in the eastern part of the county, who normally get their water from the Sacramento River and Lake Shasta, which are running low, Landon said. The challenge for Yolo County growers will be if they have the means for pumping ground water, as many disconnected their wells during good water years and others do not have access to wells, Landon said. Still, there is enough ground water in the county to go "a couple years of no rain before we have to start getting worried," Landon said. O'Halloran said the water district is working on a pilot program, launched last year with three test wells, for farmers to pump their extra ground water into the reservoir system. For now, growers will need to shift their crop patterns, Landon said, so that higher value crops are prioritized for watering, and some fields might be left dormant. Already the lack of water has resulted in sparse range land, forcing ranchers to buy additional feed or send their cattle to market early, Landon said. The county might be declaring a "disaster" for livestock by February because of the lack of rain, he said. "We are definitely in a drought, but have not declared a 'drought disaster' yet," Landon said. "We are certainly in a drought and there are certain impacts, although we're not sure what those are yet."